As I was about to pay our home bills in which my mom forced me to do, I came across the usual payment location of Globe Telecom only to find out that they moved the cashier's office to the Active Zone. It is difficult to put into words as far as to describe the aesthetics of the store, you just have to see it for yourself the brightly lit store with a stunning display of gadgets mixed with warm lights and beautiful colors. 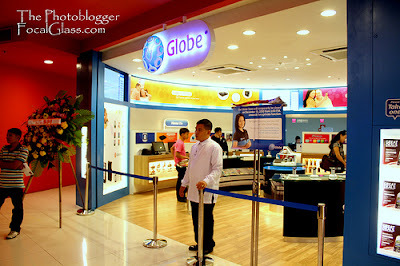 Located at the Ayala Center Cebu, the modern 220-square meter store is one of the largest stores of Globe thus far. It showcases the "Blueprint for the future" concept of Globe veering away from the traditional utilitarian concept typical of telco retailing, towards a digital lifestyle that focuses on the needs of the customers. About a few days later, I was able to attend their Launching of the Globe Store but was not able to stay for long since I have another party to attend which was in conflict with the date and time. But I was able to get this information: "The new look of the Globe Store reflects our desire to provide a full customer experience by offering a full range of products and services including the hottest gadgets and most affordable plans in town, coupled with great customer service and after sales support. Our store environment was designed to make it very easy and engaging for customers to choose the communication services they need. Our customers find the products and services they need all within the convenience of a one-stop shop.," said Maridol Ylanan, Globe Head of Stores. The head of the Consumer Mktg. for Globe--Peter, gave us a tour around the Globe Flagship Store. The whole place is like 10x times bigger than the original store where we usually enter to inquire and pay some bills physically. He explained about the concept of the store design and the whole place has been three major zones. The sales zone is where all the cool gadgets with available plans are being displayed for those who are interested in making a new mobile device purchase. The second zone is the service zone where all the inquiries and problems are attended to. Lastly they the Cashier and Platinum zone. To make it simple, At the Entrance, you will be AWED by the design and lighting (See 2nd photo above), even more if you step inside. Once your inside, you will be greeted with the various globe-gadgets to test and inspect. Then you can check out the Customer Service Area which is divided into two: One for Queries and the other to deal with After sales/Customer Service matters. There is an entrance which separates the Queries and Customer Service sections where you will enter the dedicated Billing area (for individual and corporate accounts) with also a separate room for Globe Platinum Members. So that makes it about 4 Layers in one store (including the entrance or I'm sure there is still an office behind the Cashier Place >:D)--truly a one stop shop fit for your needs! This will definitely change the way they deal and we experience their services. Your experience in Globe will be far more than just spacing out while waiting for your turn. The all new Globe Flagship Store in Ayala Center Cebu is basically one big interactive and AWESOME experience.